Ease of use, real time data collection, and rugged stainless steel construction make the CW-90 the indicator of choice for operators, quality control and maintenance departments. Enjoy the convenience of a full numeric keypad. The CW-90 is competitively priced for all light industrial needs. Ease of use, realtime data collection, and rugged stainless steel construction make the CW-90 the scale indicator of choice for operators, quality control and maintenance departments. Enjoy the convenience of a full numeric keypad. The CW-90 is competitively priced for all light industrial needs. The configuration menu of the CW-90 is accessible through the front keypad, eliminating the need to open the back of the indicator and expose the unit to moisture or contaminants. Access to these keypad controls can be limited to meet the operator's needs. The CW-90 will store detailed information for up to 50 separate IDs, allowing for easy recall of previously saved information. An adjustable contrast display is visible in any environment. 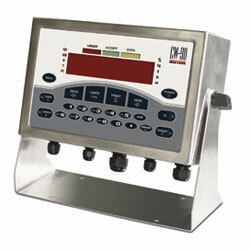 The CW-90 digital weight indicator keeps things simple to meet the needs of today's lean manufacturers. Use this checkweigh indicator by easily watching the over/under lights. Program the unit with specified weight limits and a red light will display an underweight condition, yellow for over, and green when a target weight is reached. Rice Lake's CW-90 indicator available from Central Carolina Scale will help error-proof your production process and achieve your productivity goals.